How excited was I this morning when I received a note from Kim Score over at Paper Punch Addiction saying that she would be using my Pumpkin Patch card (project 91) as one of here inspiration links on her blog today?! I’m telling you there is nothing better than when one of the “WOW” crafters stumble on to you, and like what they see 🙂 So if you get a chance click on the link above and check out her blog, she has some awesome stuff over there and is a whiz at making great creations from the basic shape punches used by Stampin’ Up! More excitement….if you can handle it…..I’m having a hard time typing this up because I know I have a box full of new stuff from the Holiday Mini catalog just waiting for me to go start experimenting for upcoming workshops! (I know…I gotta get that catalog posted up here already so all of you can drool over all the great new stuff.) I literally wanted almost EVERY thing from that catalog, so Stampin’ Up! definitely did good with this one. In fact, all the stuff I can’t afford right now is going on a Christmas wishlist to be distributed to all the people who ask me what I want for Christmas LOL! Most years when people ask me what I want for Christmas I usually refuse to answer or make up jokes (except for my husband who gets many specific requests…hehe….) because I hate “asking” people to buy me stuff, and I’m worried of someone buying me something that maybe they really couldn’t afford, but thought I would be disappointed if they didn’t get me whatever ridiculous thing I wanted. 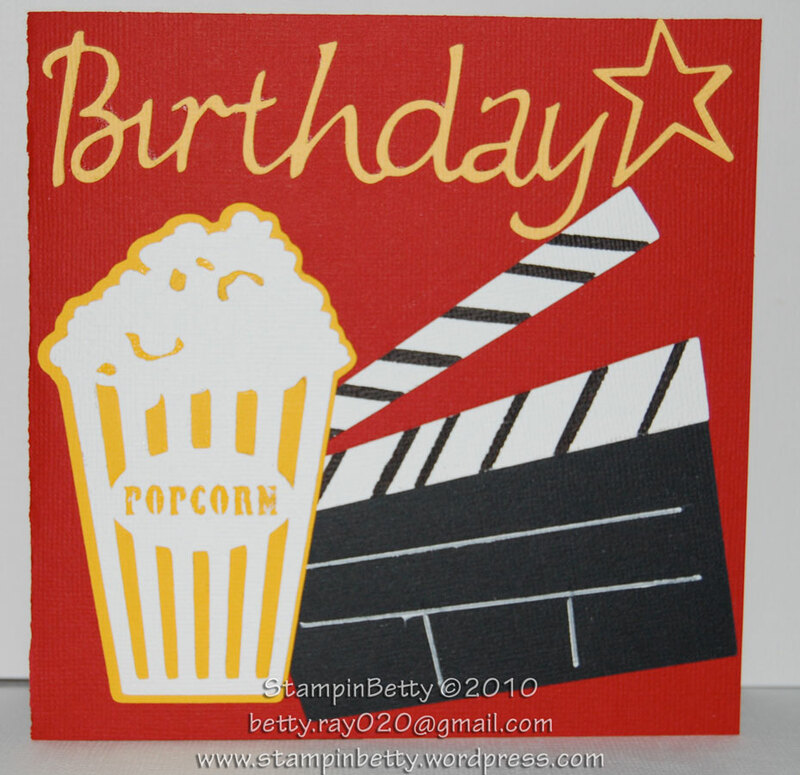 But this year I think I will put together my Stampin Up wishlist, because there is stuff in EVERY price range. Well I gotta hurry up already, and get this thing finished up so I can go play!!! I also purchased my first Halloween stamp sets, so I will soon be showcasing my FIRST halloween cards that I will be making. What a year of firsts for me… LOL! 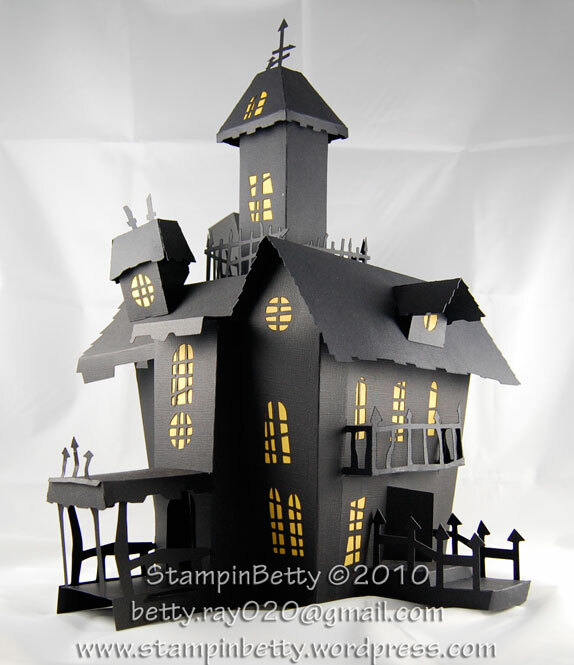 Can you believe that this whole thing is just made out of card stock? It is surprisingly sturdy!! When I picked it up to move it from my craft room to the dining room (downstairs) I was worried it would fall apart, but to my surprise it was heavier than I thought it would be, and while the walls did move a bit while carrying it they quickly put themselves back in place when I set it back down. I made this about a week ago, and have moved it to different rooms, up and down stairs, in and out of the photography booth, yet nothing came apart…..Yay!!! 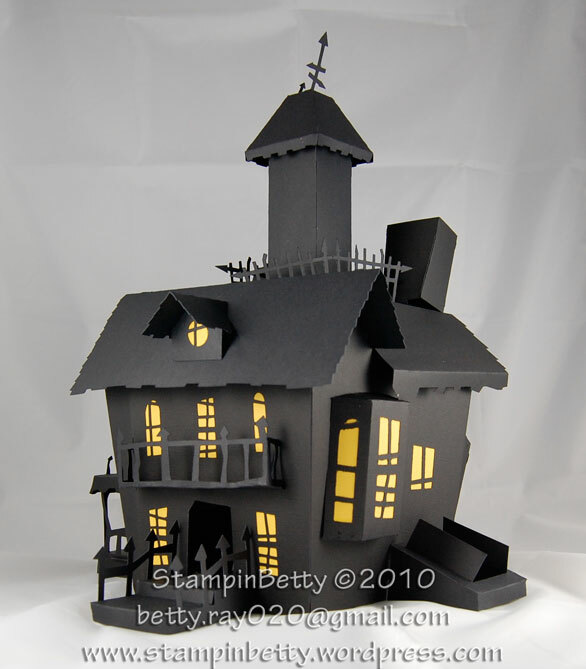 I was thinking about offering this haunted house as a kit to purchase, but it does take at least an hour to put together (and that was after it was all cut and removed from the Cricut mats), and it can be a bit trying on your patience….but once it is done it is awesome, and if you stored it in a sturdy sided plastic box you could use this as a centerpiece year after year (since it needs to be glued together to make it sturdy, you can’t fold it up to store after assembled). 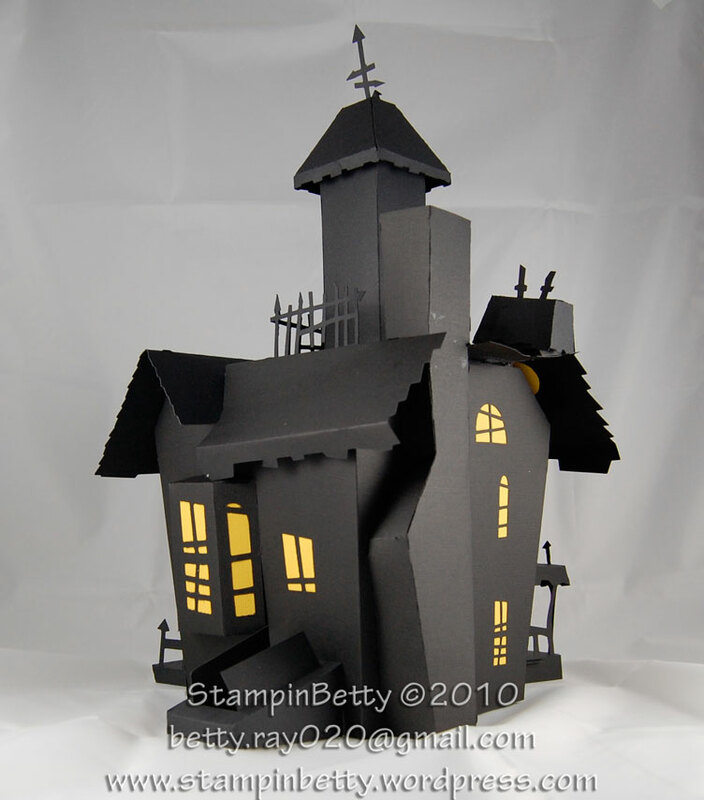 You can also create this on your own if you have a Cricut Expression and the Happy Hauntings Cartridge, but you will need the special 12×24 paper to make one as large as this one I made (putting two 12×12 sheets of paper together will not work). Hope you enjoyed this one….I know I had fun making it!! 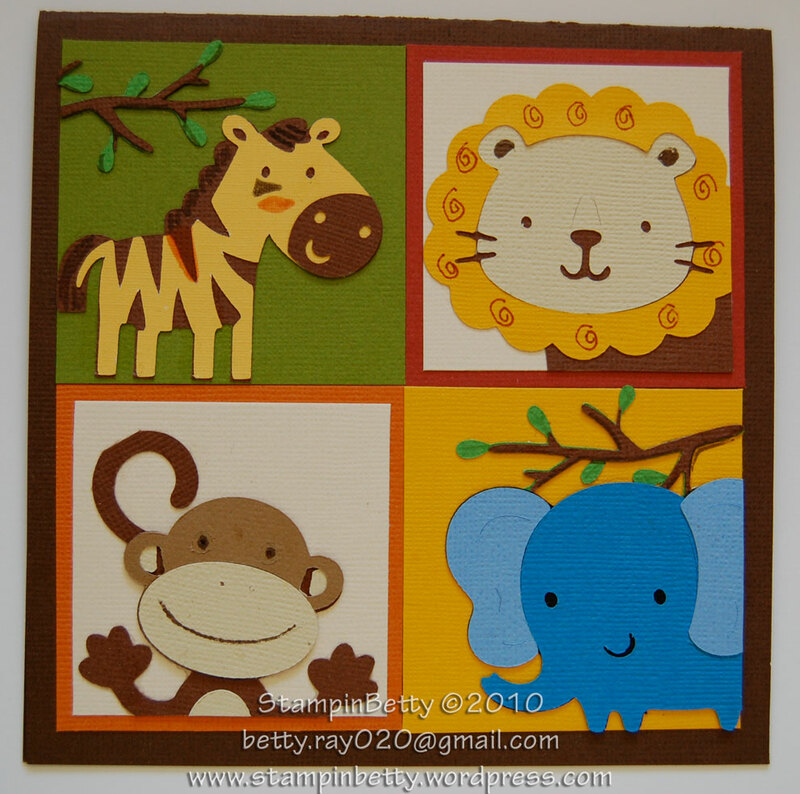 This card is the card I made for a Baby Shower I attended on Sunday. 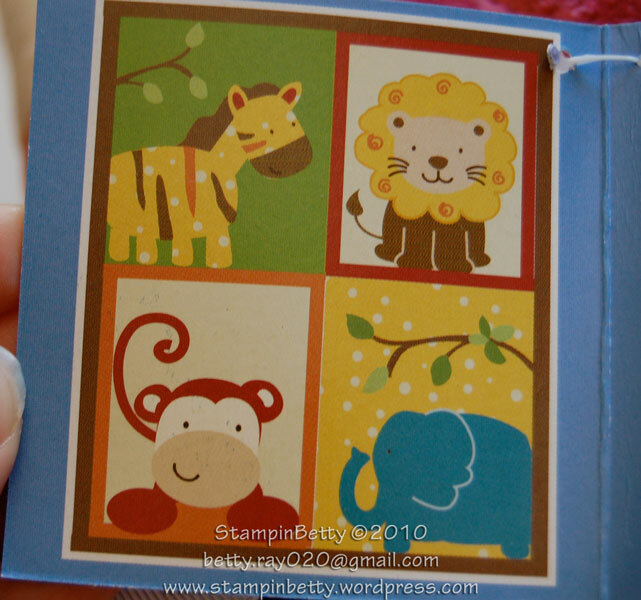 The inspiration for the card was the baby blanket I had bought as a gift from the mother-to-be’s registry. It was so cute, and I soon as I bought it I knew I had to make a card based on the design of the blanket. I had a request for more info on the items used to complete this card…. The card posted below is the Birthday card I made for my Father-in-Law. He loves going to the casino with his uncle, sometimes even in those big groups on tour buses. He’s not some big gambler or anything, he mostly just goes for fun, and this is a good thing since he is a widower, it gets him out of the house and keeps him from being as lonely. He is such a GREAT guy, I would hate to think of him unhappy! 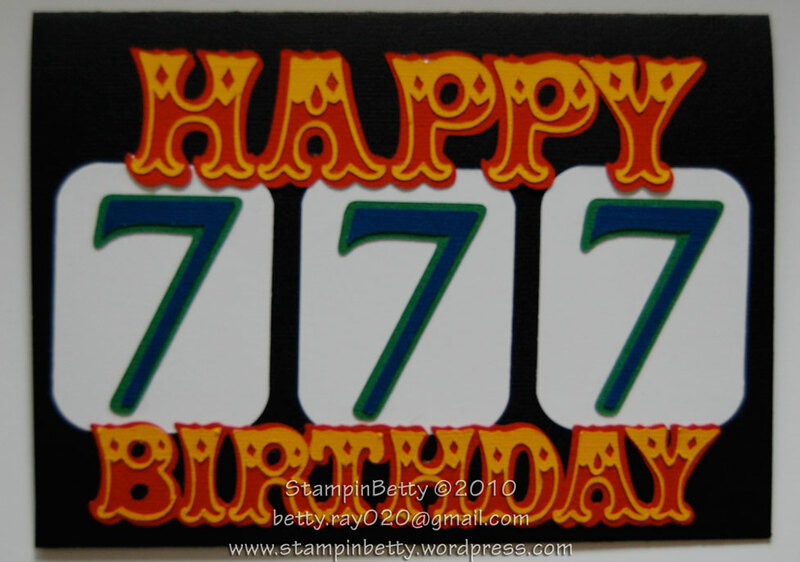 I wanted to use a slot machine as the inspiration for the card, unfortunately I didn’t have any Cricut cartridges with a slot machine, and I couldn’t find any vector images that would have properly cut with my Sure Cuts A Lot, so I decided to just make the front of the card look like the windows on the slot machine with the winning 777 showing. I think it worked out pretty cool. Just a hint…..if you have super tiny, intricate cuts that you need to layer, the best way is to use a Zyron sticker machine. For the “Happy Birthday” I just used the cheaper 1.5″ sticker machine. It worked great because I didn’t have to try to use (and clean up) glue on these TINY slivers. 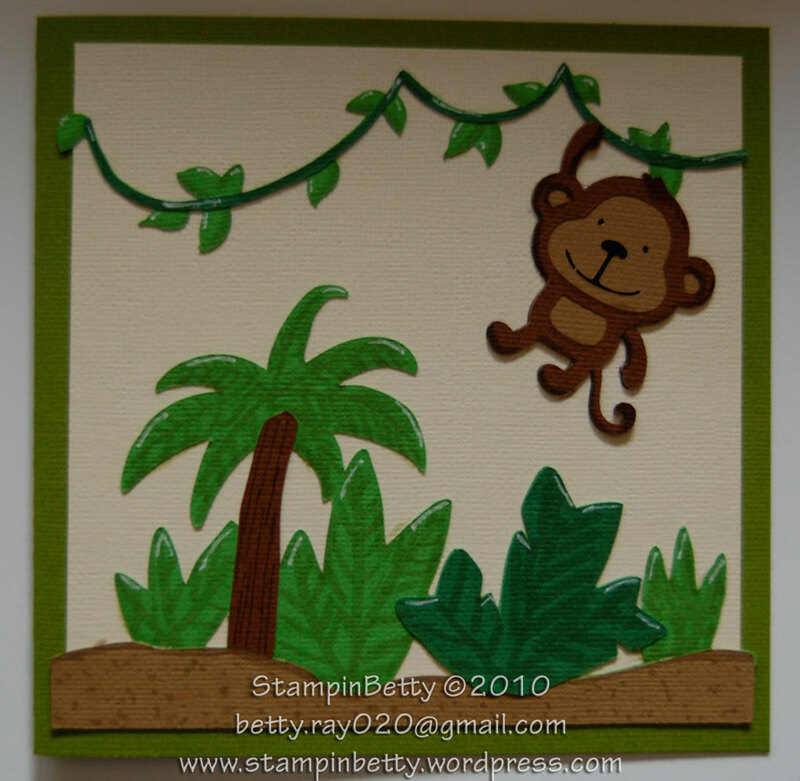 Check back soon as I plan on getting back in my craft room and back to some Stampin’ UP! stamping. Let me know if you have any requests for a stamp set I should concentrate on. Do all my home improvement projects count as crafts?? LOL! If so I could show you what has been keeping me from the wonderful world of projects I usually post here 🙂 Actually, as I have time I probably will post some of the home improvements we have done this year. 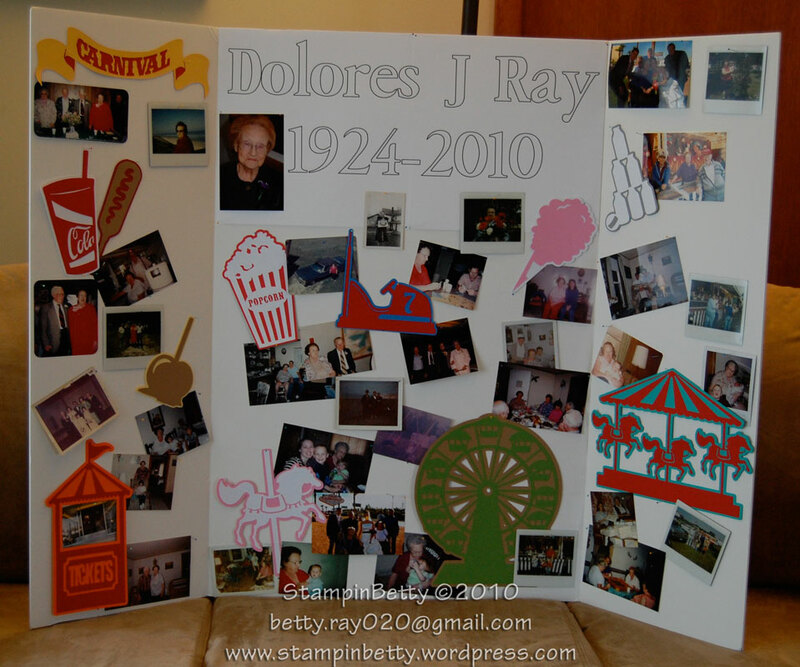 As promised last week this is the photo display I made for my grandmother’s funeral. I wanted something more than just pasting pictures to a board. I wanted a theme….something that would make everyone smile as they browsed over the pictures…and their own memories of grandma. My grandparents owned several concessions that were regularly booked into fairs, and they LOVED all the travelling. So the best fitting theme I could think of was the Carnival. Armed with my Cricut, Gypsy, and pile of textured cardstock I went to town. 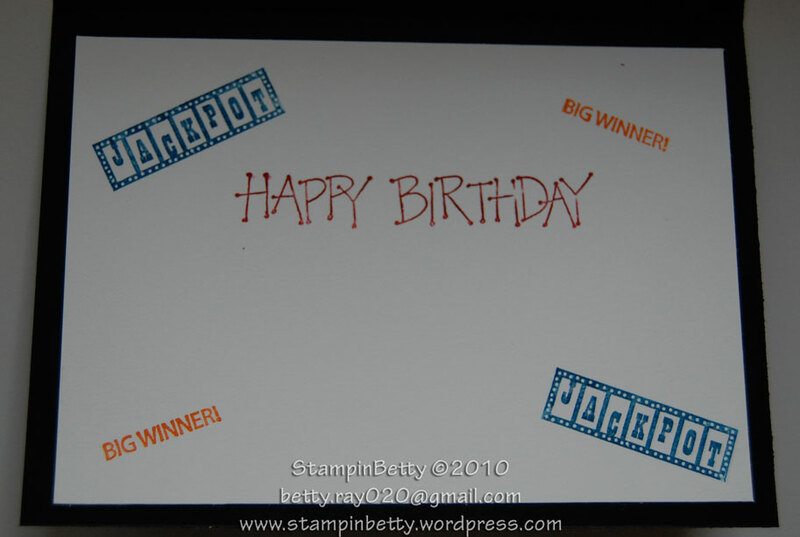 I know I have been moving away from concentrating solely on Stampin Up!, but I think this is an appropriate move. 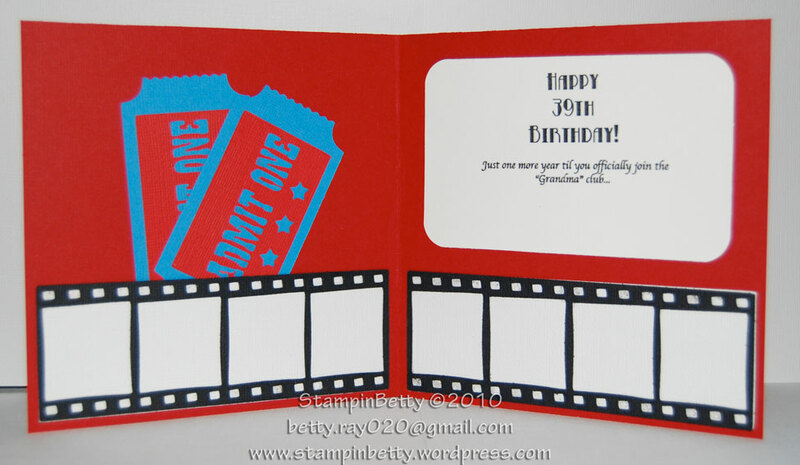 While I am sure the majority of my projects will still be Stampin’ Up!, as I am so completely in love with their products, there are so many other crafts that I also love and want to share with you. Tis true, I am slightly behind on my 365 project goal. It has been a sad time around the house… My grandmother, who was the closest thing I had to a “Mom” growing up has fallen very ill and has “temporarily” been placed in a nursing home. Personally, I’m not so sure this is a temporary move for her. First, I should clarify, that I have a VERY lovely, kind mother, unfortunately I did not know how wonderful she was until I was almost 30 years old, as unusual events resulted in my brother and I being raised by our grandparents and ill father. This is why I say my grandmother was my Mother-figure growing up, and I have to say Grandma did an AWESOME job raising us!!!!! My brother is now an Electrical Engineer, with a wonderful wife, and beautiful daughter, and they live Charlotte, NC. I have a Master’s Degree, the best husband in the world, and the two coolest Bullmastiffs ever, here in Milwaukee. Who could ask for more??? I know sooooooo many others who grew up in situations like ours and took such a drastically different path than we did, and I can only believe that my grandparents must have played a BIG role in this. They never gave us anything for free, we had to work hard for everything. They never babied us because we had unfortunate childhoods. They didn’t have a lot of money, but what they did was make sure we knew we could do anything we wanted as long as we worked hard at it. They made sure we knew life was not supposed to be easy…to get somewhere in life you had to fight for it, and never give up. They reminded us that if someone told us we couldn’t do something because we didn’t have the “right upbringing” we had to stand up and SHOW them we could. Because of our grandparents we knew the world did not OWE us something just because we had it harder than others, and that the only way someone was going to get us down was if we let them. Four years ago today, grandfather passed away. Now it seems as though grandmother wants to give in and join him. I visited her 2 days ago (her nursing home is 2 1/2 hours away). After spending the day with her it was clear that she misses grandfather terribly (they were married well over 60 years, and since they owned and ran a business together they never spent more than 24 hours apart.) I thought about how hard it was to think of her being gone, but I also thought about how unfair and selfish it is to continue to beg her to fight and stay here. She is 86 years old and in constant pain every day. She has had so many surgeries, and there is no way her life will ever be comfortable again. Yet family members insist on more and more treatments and surgeries to keep her alive. It hurts me to think of the pain she is in and the fact that she will never be well again, yet is forced to endure more and more pain, instead of accepting the fact that no one lives forever and it is not fair to “torture” someone. How could they even agree to giving a frail 86 year old chemotherapy???? When our pets are in pain that we know we can not make better, putting them to sleep is considered the only humane thing to do. Yet, when our parents and grandparents are in torturous pain, and begging to “go home” after having lived a very LONG and FULL life we pump them with poisonous chemo, and further surgeries just so we don’t have to say good-bye. SHAME on us!!!!! I would not wish her agony on anyone, which is why I kneeled beside her bed with her almost lifeless hand in mine and told her how much I loved her, and how thankful I was that she raised me to be the person I am, and with tears in my eyes I told her that if she was tired and if she felt she had waited long enough to be reunited with grandpa that it was okay to go to him, that everyone was taken care of here, and no one would be upset at her for her for going. She grasped my hands with more strength than I had felt from her in a long time, looked me in the eye, with tears in hers, and said thank you, I love you so much. It was the hardest thing I have ever said to anyone, I only wish the rest of them would tell her the same and let her go peacefully. Today’s projects aren’t Stampin Up, but they are too cool to not show you all, plus they were the other time consumer that has put me behind on my 365 goal (luckily I am only a few projects behind, and there are still 10 1/2 months to get them all done). In total we made 12 of these hats (I think there was one missing when we took the photos.) 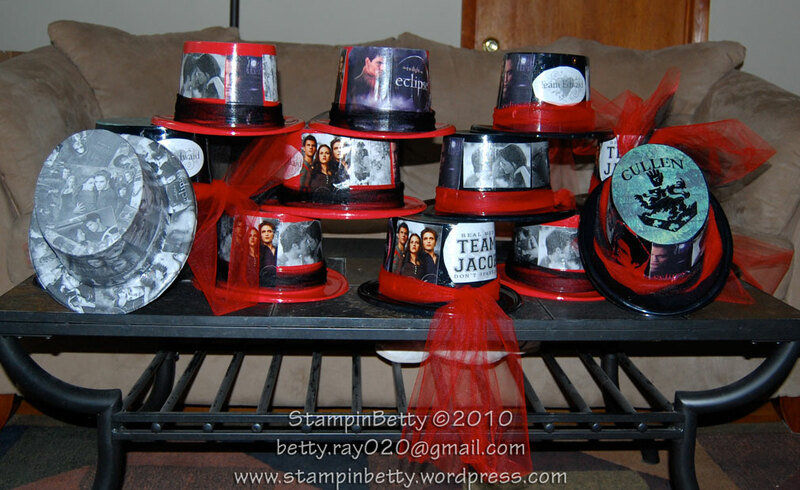 There are 4 different “designs” in these hats (hence counting them as four projects.) 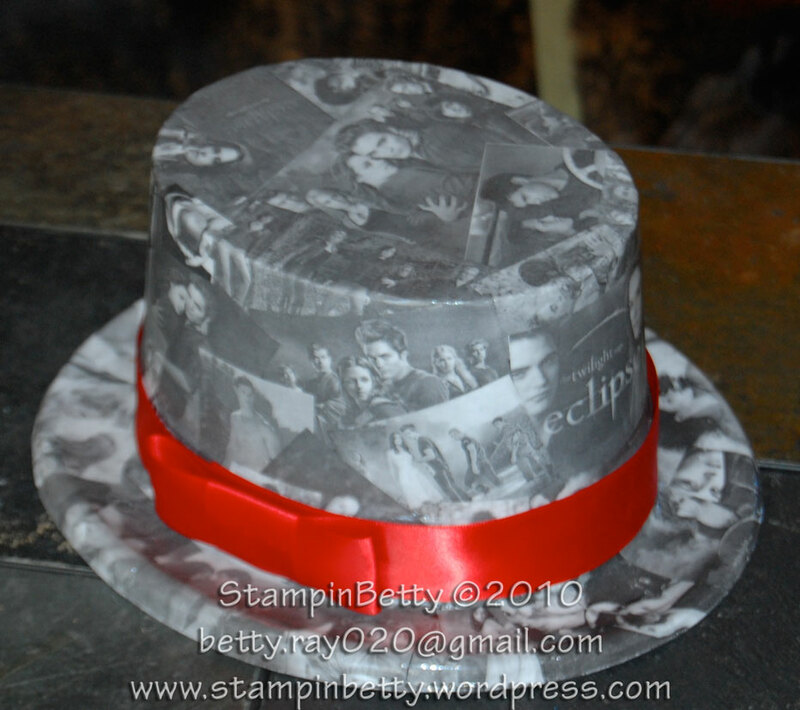 There is my hat which is totally different from everybody else’s (completely covered with black and white photos with red satin ribbon.) 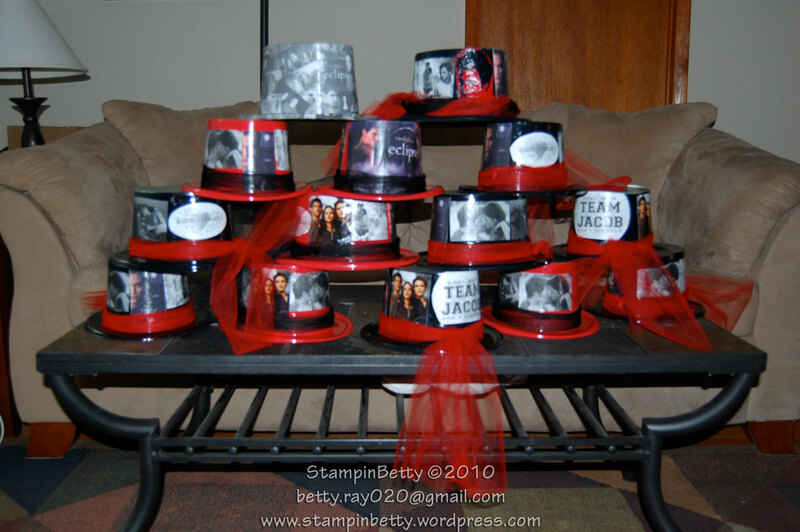 There is Tina’s hat which has the basic design of the rest, but then I cut some really cool stuff on my die cutter for her to add, and she used red and black tulle ribbon. 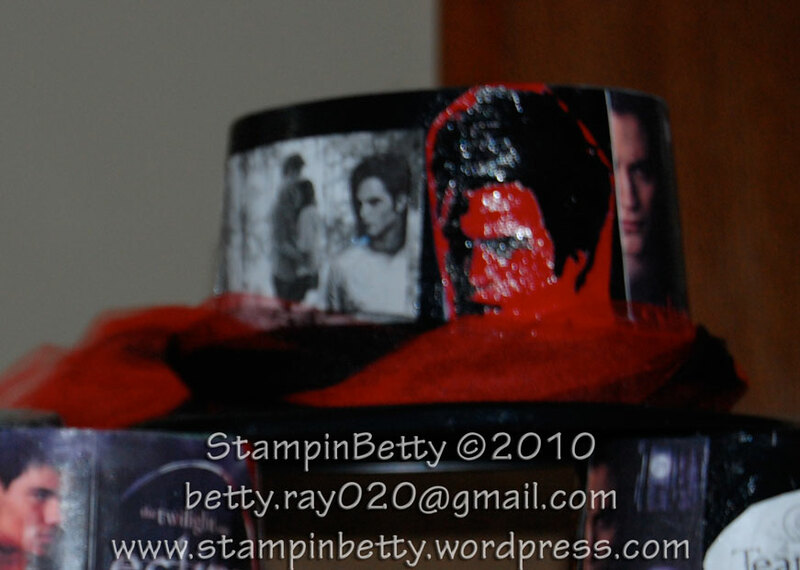 Then there are Team Edward, and Team Jacob hats. I should also be clear that I did not make all the hats. The design for all the hats (except mine) was a collaborative idea from Tina, her two daughters, and me. And everyone helped put the hats together. 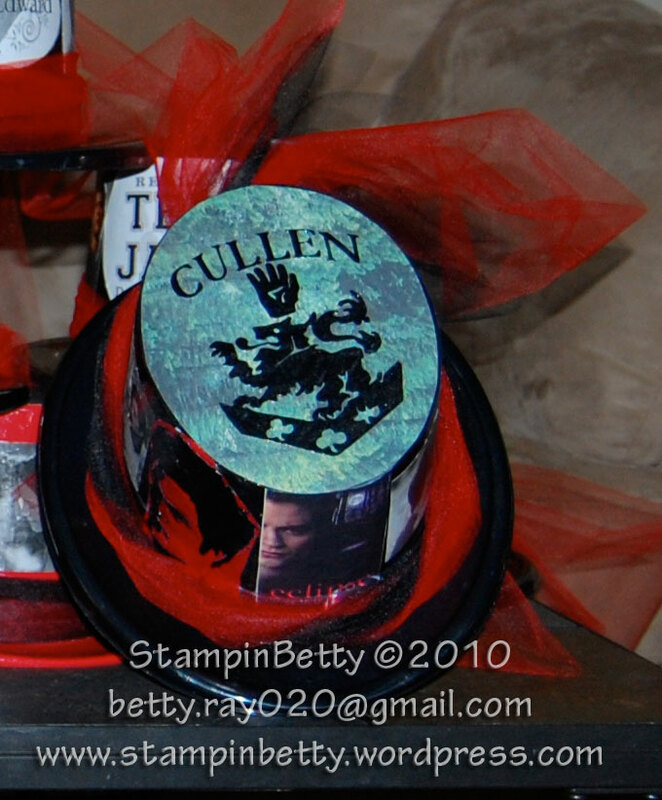 The reason I am including Tina’s hat as project 44, even though she assembled it, is because I made the die cut Edward profile, and Cullen Crest for her, and making these die cuts was quite a “project” 🙂 But aren’t they awesome?? If anyone is interested in purchasing a hat like one of these please let me know and we can work out a price and details for you. 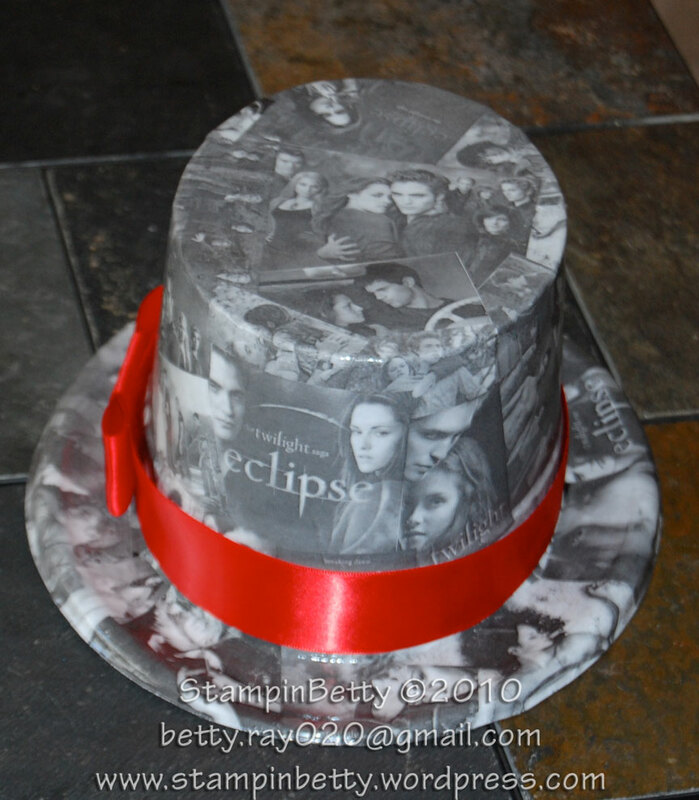 I can make hats like these for ANY occasion!! Email me at betty.ray020@gmail.com or leave a comment below with your email asking me to contact you.